Rummaging around my nail polish stash has unearthed these six little summer stunners. Mostly in the warmer weather I like a nice classic bright, like this red Sally Hansen shade, the pink Artdeco number or the juicy orange of Chanel's Holiday. But I also like the odd shimmery metallic shade - they look gorgeous sparkling in the sun - which is where this Essence number comes in. It's a lovely bronzey/pewtery colour. And of course, summer is the time to experiment a little, so I'm also digging these shiny blues, which are both just that little bit special. The Max Factor shade has a bit of duochrome action going on, while the Avon shade is a dazzling, super sparkly glitter. Now for the hard part - which ones will I wear to travel to Barcelona?!? What summer nail colours are you loving right now? I need to get my hands on Holiday! The Chanel one looks a lot like OPI´s Monsooner or later in this pics - a great color for the vibrant city of Barcelona! Great travel destination! Right now I love Very Red by Essie for my toe nails and the lighter Tarte-deco for my fingers! I love the look of that avon one! Those Max factor minis are great too, love the colour range! You can't beat gold for a summer neutral! Have an amazing time in Barcelona! Love the Chanel and opi! Ooh I've never seen that Sally Hansen! Truth be told pretty much ALL of the Complete Salon range is Summer appropriate, I love a nice gold or blue for summer months too. I have a really pretty shade of light blue that I want to try on my toes. 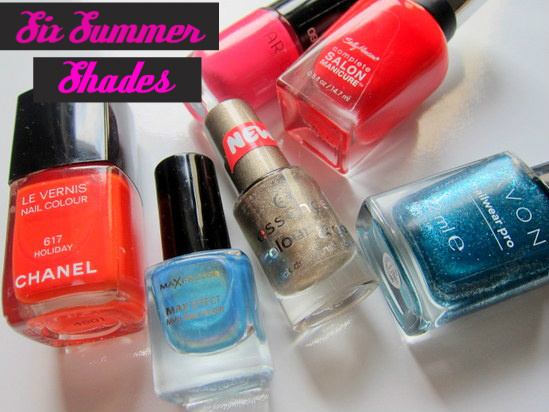 And of course, I always love coral shades for summer!